kiss my black ads: Obama's brainwashing your kids to love country, freedom & stuff! Obama's brainwashing your kids to love country, freedom & stuff! NEW YORK (AP) - Coming two weeks after Election Day, a book from President Barack Obama for some of the nation's nonvoters: inspirational stories for children about American pioneers. "Of Thee I Sing: A Letter to My Daughters" is a tribute to 13 groundbreaking Americans, from the first president, George Washington, to baseball great Jackie Robinson to artist Georgia O'Keeffe. It will be released Nov. 16 by Alfred A. Knopf Books for Young Readers, an imprint of Random House Children's Books, which will officially announce the new work Tuesday. Knopf declined to identify the other 10 subjects. Obama is not the first president to write for young people. Jimmy Carter's "The Little Baby Snoogle-Fleejer" was published in 1995, more than a decade after he left office. More in line with Obama's effort, Theodore Roosevelt collaborated with Henry Cabot Lodge on "Hero Tales from American History," released in 1895, before Roosevelt was president. Obama's book is illustrated by Loren Long, whose many credits include Watty Piper's classic "The Little Engine That Could," Randall de Seve's "Toy Boat" and Madonna's "Mr. Peabody's Apples." Long wrote and illustrated the children's stories "Otis" and "Drummer Boy." His cover design for "Of Thee I Sing" is a sunny impression of presidential daughters Sasha and Malia Obama walking their dog, Bo, along a grassy field. Random House children's president and publisher Chip Gibson lauded the new Obama book, which is intended for readers ages 3 and up. "It is an honor to publish this extraordinary book, which is an inspiring marriage of words and images, history and story," Gibson said Monday in a statement. 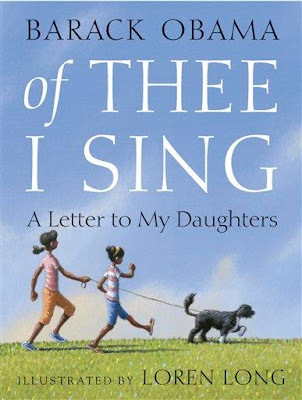 "'Of Thee I Sing: A Letter to My Daughters' celebrates the characteristics that unite all Americans - the potential to pursue our dreams and forge our own paths." Obama's 40-page book will have a first printing of 500,000 copies and a list price of $17.99. Both of Obama's previous works, the memoir "Dreams From My Father" and the policy book "The Audacity of Hope," are million sellers published by Crown, a division of Random House Inc.